It should be noted that GDPR does not apply to information already in the public domain. IVSTITIA Limited uses the information collected from you to process annual billing, make telephone contact and to email you information and support which IVSTITIA Limited believes may be of interest to you and your business. In you making initial contact you consent to IVSTITIA Limited maintaining a dialogue with you until you either opt out (which you can do at any stage) or we decide to desist in providing our services. IVSTITIA Limited also acts on behalf of its clients in the capacity of data sub-processor. When working exclusively as a data sub-processor, IVSTITIA Limited will be acting on the instruction of its client, and will work hard to ensure that the client is fully GDPR compliant. Some personal data may be collected about you, from records of our correspondence and phone calls and details of your visits to our website, support system or case management system including but not limited to personally identifying information like Internet Protocol (IP) addresses. IVSTITIA Limited may from time to time use such information to identify its visitors. IVSTITIA Limited may also collect statistics about the behavior of visitors to its website visa Google Analytics. Any information IVSTITIA Limited holds about you and your business encompasses all the details we hold about you and any sales transactions including any third-party information we have obtained about you from public sources and our own suppliers such as credit referencing agencies. IVSTITIA Limited will only collect the information needed so that it can provide you with marketing and consulting services, this agency does not sell or broker your data, although coincidentally there may be times when your information could be contained in data that IVSTITIA Limited has purchased from a third-party list broker, on behalf of a client or through your agency. To meet IVSTITIA contractual obligations to clients and to also respond to potential clients. To promote the support, training and consulting services offered by IVSTITIA Limited and products offered by IVSTITIA Limited to its existing clients. Through agreeing to this privacy notice you are consenting to IVSTITIA Limited processing your personal data for the purposes outlined. 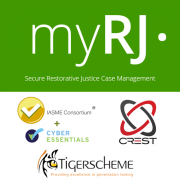 You can withdraw consent at any time by emailing hello@myrj.co.uk or writing to us, see last section for full contact details. IVSTITIA Limited may on occasions pass your Personal Information to third parties exclusively to process work on its behalf. IVSTITIA Limited requires these parties to agree to process this information based on our instructions and requirements consistent with this Privacy Notice and GDPR. IVSTITIA Limited do not broker or pass on information gained from your engagement with the company without your consent. However, IVSTITIA Limited may disclose your Personal Information to meet legal obligations, regulations or valid governmental request. IVSTITIA Limited will process personal data during the duration of any contract and will continue to store only the personal data needed for five years after the contract has expired to meet any legal obligations. After five years any personal data not needed will be deleted. Data is held in IVSTITIA Limited using different (multiple) servers based in the UK in secure data centres. IVSTITIA Limited does not store personal data outside the EEA. In the event that IVSTITIA Limited refuses your request under rights of access, we will provide you with a reason as to why, which you have the right to legally challenge. Identity and the contact details of the person or organisation IVSTITIA Limited that has determined how and why to process your data. Contact details of the data protection officer, which is our Managing Director, where applicable. If the processing is based on the legitimate interests of IVSTITIA Limited or a third party such as one of its clients, information about those interests. IVSTITIA Limited will accept the following forms of ID when information on your personal data is requested: a copy of your driving license, passport, birth certificate and a utility bill not older than three months. A minimum of one piece of photographic ID listed above and a supporting document is required. If Digital Web Media Limited is dissatisfied with the quality, further information may be sought before personal data can be released. All requests should be made to hello@myrj.co.uk or by phoning 0845 868 4932 or writing to us at the address further below. In the event that you wish to make a complaint about how your personal data is being processed by IVSTITIA Limited or its partners, you have the right to complain to IVSTITIA Limited’s Managing Director.